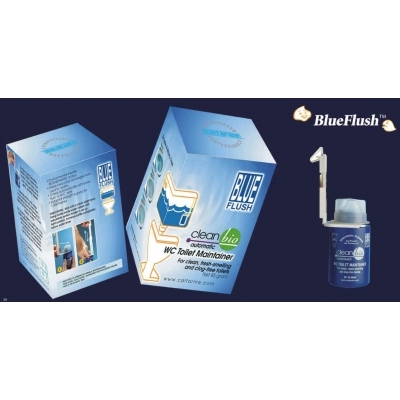 CleanBio BlueFlushTM works automatically with every flush, releasing a powerful biological cleaning formula that breaks down organic waste. By clearing organic waste out of the toilet system, CleanBio BlueFlushTM eliminates the source of stains, encrustations and malodours. At the same time, it keeps drains free flowing and choke-free. DOSAGE: BlueFlushTM is industrial strength, good for 1,000 -1,500 flushes. DIRECTIONS: Hang bottle inside water cistern with adjustable system holder in an upright position. Immerse bottle completely below water level. DIRECTIONS - Hang bottle inside water cistern with adjustable system holder in an upright position. Immerse bottle completely below water level. DOSAGE - BlueFlushTM is industrial strength, good for 1,000 -1,500 flushes.